so could you put a railway running up the west coast into the north west? oak, you have an absolutely amazing talent at putting continent names on the map, they look fantastic. 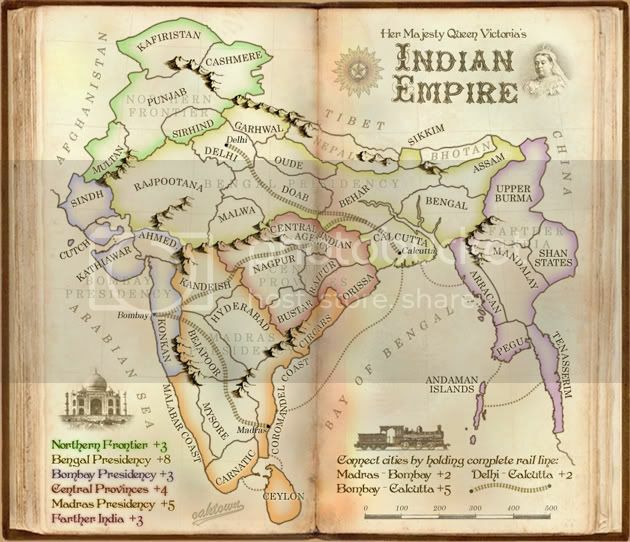 (India, and Eastern Hemisphere maps). This was somewhat of my feeling also. I notice there is an attack loop between Calcultta, Bombay and Madras, but nothing similar in the west. Won't that create an in-balance in the gameplay? Perhaps a line from Delhi to Sindh (Karachi, if there was a line running out there), and then a coastal shipping route from Bombay to Karachi. Also. i know this is late in the piece and you can reject all of this if you want, but I've recently become acquainted with some British-Indian history through the magic the ABC TV here in Oz. Isn't the Taj more of a symbol of the Mogul Empire of India. While I realise it is probably the most recognised building in the world (so they say) i would have thought that some building from the British construction and architecture of New Delhi would be more defining of the British Period for India. For the train bonuses, do you mean that you have to hold all territories that the rail-line traverses to get that bonus. That is kind of unclear that way it is written in the legend. Oaktown, IMO i've gotta say that i'm not a big fan of the Presidency names on the map in the background. They overlap and collide with the territory names in many places and this causes my eyes to be lead away from the actual territory names to try to read the Presidency names. I voted for Queen Victoria. She was known as the Empress of India. So Queen Victoria would fit in more with what you have in the title style. I must say that I'm surprised the 4th option made it into the poll. So apart from that, if none of those things are considered issues by the rest of the foundry, after seeing the Small version with some armies on it for placement, i'd be happy to say FF. They aren't totally awesome splendid perfect (but I think they are fine), but I'll argue function over form in this case, as within just the last couple of days we've had some people in the Suggestions forum talking about how some maps are hard to distinguish for colorblind people, without any continental/zone labels. Certainly I could, but there are two problems with this. The first is that the north west is already made up of small, controllable regions. Both Bombay Presidency and Northern Frontier are fives territory, three border +3 regions. And both are going to be ideal start positions due to their locations on the edges of the map. Running a rail line up the west would be redundant. The second reason I wouldn't want a rail line there is because it didn't exist. The current lines are historically accurate and based on the rail system of India in the 1860s-1870s. cairnswk wrote: I notice there is an attack loop between Calcultta, Bombay and Madras, but nothing similar in the west. Perhaps a... coastal shipping route from Bombay to Karachi. Well, I kinda liked the linear nature of that region. An attack route from Bombay to Karachi (Sindh) wouldn't be a bad thing, but I'm not sure it contributes much to gameplay. The fact that there is a sea route in the east isn't a good enough reason to justify a sea route in the west, but if there is further justification for adding a western sea route I'm willing to consider it. cairnswk wrote: Also. i know this is late in the piece and you can reject all of this if you want, but I've recently become acquainted with some British-Indian history through the magic the ABC TV here in Oz. Isn't the Taj more of a symbol of the Mogul Empire of India. While I realise it is probably the most recognised building in the world (so they say) i would have thought that some building from the British construction and architecture of New Delhi would be more defining of the British Period for India. I hear where you're coming from on this one... the Taj wasn't held in as high regard in 1870 as it is today. This is kind of like the Queen v. Empress question - Empress might be correct, but Queen is what CC users will relate to. Using an English building might be more true to the historical flavor of the map, but the average user might wonder what it is. cairnswk wrote: For the train bonuses, do you mean that you have to hold all territories that the rail-line traverses to get that bonus. That is kind of unclear that way it is written in the legend. (sighs) I've probably changed the language of this a dozen times over the life of this thread, and every time I change the language somebody suggests language that somebody else has already rejected. I don't really give a damn what it says, so if you have a better idea I'd love to hear it. cairnswk wrote: Oaktown, IMO i've gotta say that i'm not a big fan of the Presidency names on the map in the background. They overlap and collide with the territory names in many places and this causes my eyes to be lead away from the actual territory names to try to read the Presidency names. As a colorblind user I would rather err on the side of too much information. There are already too many maps out there that I can't play. cairnswk wrote: I voted for Queen Victoria. She was known as the Empress of India. So Queen Victoria would fit in more with what you have in the title style. I must say that I'm surprised the 4th option made it into the poll. I'll probably stick with "Queen" - though had it been close I was comfortable just saying "Her Majesty's." And whenever I post a poll around here I like to include one option for those that share my general opinion of Foundry polls, which is that they are meaningless. cairnswk wrote: So apart from that, if none of those things are considered issues by the rest of the foundry, after seeing the Small version with some armies on it for placement, i'd be happy to say FF. Page 12 of this thread has a small map with three digit counts. ---The Indian Empire Map has reached the 'Final Forge' Stage. The map has passed rigorous gameplay and graphics examinations, and major concerns have been addressed. If you have any other concerns, please make your voice heard. As long as there is still discussion or posts that have yet to be commented on, the map will remain in Final Forge until said discussion has reached the conclusion that the map has reached its final and polished version. After a reasonable amount of time has been given for final comment, and after the completion of the XML, the map will be deemed finished with the 'Foundry Brand' of approval and will be submitted for live play. Great to see an India map make FF, I've been waiting for this a long time. all questions raised answered well. wow, I have two maps in the Forge at the same time... so this is what happens when you resign from being a CA, eh cairnswk? I'll get on wrapping the pages in and showing coordinates again. Large and small maps, with the wrap between the pages. Ooph … I could've sworn I had already checked this. I'll do it later today, so'z. It actually does require some work. Anyway, what is a poll going to get us? 32 people will vote, one of the five suggested options will win with 9 votes, which means 23 people will disapprove of the final. Foundry polls are useless. What is useful is descriptive feedback. The first attempt at showing the page wrap was too strong, so now I've made it more subtle. Nobody has mentioned any problems with the current wrap. If it's too strong, or not strong enough, tell me by how much and why and I can fix it. But the current poll can certainly go... I'll PM somebody. In a couple of places (most notably Mysore, Bejapoor, and Doab) the numbers go over the RR tracks. Ehh, there're a couple easy spots to change, but some you can leave. I think you can move the word "Mysore" down and left, moving the co-ord up and left above the name. For Doab, you can leave the name as is but move the co-ord down so only the 888 nicks it. Could you scoot the portrait of Q. Victoria a bit right if it's not too much trouble? On the "E" of "Bengal Presidency," there's a white stroke around. Those last two are crazy nitpicks, but the co-ords — should be fine as is, those fixes would only improve upon an already-stampable map. would that be the E in the page fold? becauser there are three Es in Bengal Presidency, all of which have a light glow to make them easier to read (I outer glow just about everything for contrast). The one in the fold shows the most because of the shadow - I can clean that up a bit. Yeah it's the fold one. By the way (I meant to edit this in): I only suggested you change the co-ords on the RR tracks because there have been some players who are confused by the Subway on the NYC map. Like I said, it's stampable as is if you don't want to change. the.killing.44 wrote: By the way (I meant to edit this in): I only suggested you change the co-ords on the RR tracks because there have been some players who are confused by the Subway on the NYC map. In some places I put the coordinates on the tracks or across the tracks from the territory title on purpose to show that the tracks are within the territory, and not a border. I agree that the coordinates should not touch tracks in the NYC map, but that is because the tracks represent attack routes on that map. There are no distinct station territories on this map, and I hope that there is nothing that would suggest the a player that they can jump their attacks along rail lines.